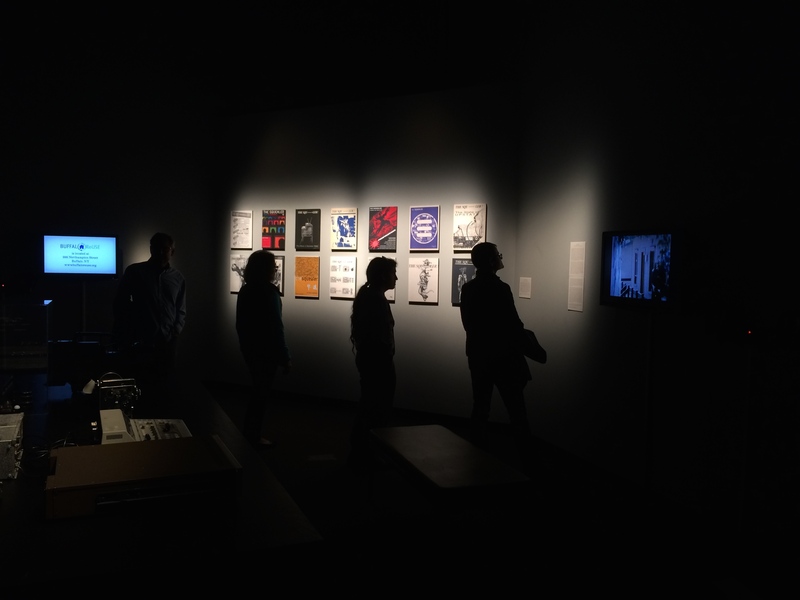 Join us for the opening reception of Squeaky Wheel’s 30th Anniversary Exhibition at the Burchfield Penney Art Center Project Gallery, which celebrates the past, present and future of our legacy as a media art center in Western New York. The opening reception takes place on Friday, October 9, 5:30 – 8:00pm, during the M&T Bank Second Fridays at the Burchfield Penney Art Center. Members of the Burchfield Penney Art Center will receive free admission to the museum and additional programs during this time. The exhibition is on view from October 9, 2015-January 24, 2016. Curated by a special committee assembled by Squeaky Wheel, work by founding members, former and current staff, resident artists, and additional media mined from popular programs, is brought together to comprise an inclusive survey that pays homage to the organization’s thirty years as a pioneering media art presence in Buffalo and beyond. Highlights from Squeaky Wheel’s myriad youth media initiatives, long-running public access broadcast (Artgrease – formerly known as Axlegrease), documentary initiative Channels: Stories from the Niagara Frontier, and DIY media art publication, The Squealer – provide a window into the organization’s rich history, many influences and evolutions, and impacts within the broader media art world at-large. In the spirit of Squeaky Wheel’s core operational values of accessibility and community participation, the public is invited to make a contribution to the exhibition by recording impromptu-style videos in a story booth station installed in the Project Space. During the opening reception on Friday, October 9, there will be a special performance at 8:00pm by the Reactionary Ensemble in The Front Yard at the Burchfield. The Reactionary Ensemble is an avant-garde multimedia collaboration comprised of Buffalo-based musicians Jim Abramson, David Adamczyk, Don Metz and T. Andrew Trump, with video artist Brian Milbrand. This one-night only performance unveils a new collection of works, including a minimalist interpretation of the cinematic partnership between Alfred Hitchcock (1899-1980) and composer, Bernard Herrman (1911-1975) and a raucous celebration of Italian giallos featuring vocals by Holly Johnson. The Reactionary Ensemble’s live audio-visual performance mimics elements of synesthesia through use of custom software designed by Brian Milbrand, which processes real-time interactivity and instrument responsiveness that directly corresponds and alters the audio and visuals being performed. The effect of this process creates a highly entwined audio-visual immersion that is considered to be psychedelic and often apocalyptic. Other pieces in the show include Thunderbird, a look at the appropriation of Native American gods for selling material good, and Godzilla, an ode to the destructive forces created by nuclear radiation. In the event of rain or poor weather conditions, this performance will take place in the TV studio in 103 Savage Theater Arts Building at SUNY Buffalo State College. Artists included in this survey: 8mm News Collective, Alex Anas, Fred Bacher, George Bagdasarov (as Labodoble Infinito with Alex Moralesova), Jason Bernagozzi, Peer Bode, Diane Bonder, John Bono, Dorothea Braemer, Buffalo Artists Against Repression and Censorship, Cade Bursell, Patrick Cain, Anna Chiaretta Lavatelli, Martha Colburn, Tony Conrad, Jax Deluca (in collaboration with Flatsitter), Ghen Dennis, Roberta Dombrowski, Julia Dzwonkoski, Ron Ehmke, Rachel Fein-Smolinski, David Gracon, Stephanie Gray, Ruth Goldman, Daniel Henderson, Paris Henderson, Armin Heurich, Kathy High, Chris Hill, Cheryl Jackson, Eric Jensen, Meg Knowles, Caroline Koebel, Mike Kuchar, Jody Lafond, Al Larsen, Barbara Lattanzi, Carl Lee, Mark Longolucco, Andrea Mancuso (as Virocode with Peter D’Auria), Stella Marrs, Matthew McElligott, Tammy McGovern, Media Coalition for Reproductive Rights, Brian Milbrand, Vincenzo Mistretta, Jan Nagle, Danny Plotnick, Robby Rackleff, Matthew Rousselle, Doug Ruffin, Ruth Sergel, Ellen Spiro, Brian Springer, Kelly Spivey, Studio of the Streets, Carolyn Tennant (in collaboration with J.T Rinker), Tiny Circus, Igor Vamos, Paula Watkins, Diedie Weng, Richard Wicka and Julie Zando. This exhibition is on view through January 24, 2016. Please visit the Burchfield Penney Art Center website for more information about museum admission and activities.